In many case, it is necessary to obtain the information about direction of flow of power where power can flow to the fault from both the directions. In such cases, it is necessary that the circuit breakers on both sides must trip. Thus the directional relays are necessary for such systems. The examples of such systems are parallel feeders, Tee feeders, ring mains and interconnected system. The protection of such systems is obtained using both directional as well as nondirectional relays. The Fig. 1 shows the parallel connection of three feeders which are connected between a power station and remote supply point. 1) From power station directly. 2) From feeder 1 through receiving end busbar directly. 3) From feeder 3 through receiving end busbar directly. It is necessary to open, circuit breakers 3 and 4, to clear this fault and disconnect the faulty feeder. Thus the nondirectional relays are employed on supply side while the directional relays are employed on receiving end. The directional relays on receiving end operate only when the fault power is feeding in the direction of the arrow. Hence when fault F on feeder 2 occurs, then all three nondirectional relays on supply side will operate while only directional relay 4 will operate on receiving end. But it is important that circuit breakers on feeder 1 and 3 on supply side should not operate. This is achieved in practice by keeping the time of operation of relays 1 and 5 more than the time of operation of relay 3. The fault current in feeders 1 and 3 is much smaller than the fault current in feeder 2 as 1 and 3 provide high impedance as fault gets supplied indirectly. The relays have inverse time characteristics hence for small current, the relays take long time to operate. Thus by the time relay 3 operates and isolate the fault, the relays 1 and 5 do not operate. Once fault gets cleared, the relays 1 and 5 remain operative and feeders 1 and 3 keep on supplying the power. The method of protection used for the parallel feeders is also used in the protection of tee feeders. The arrangement is shown in the Fig. 2. 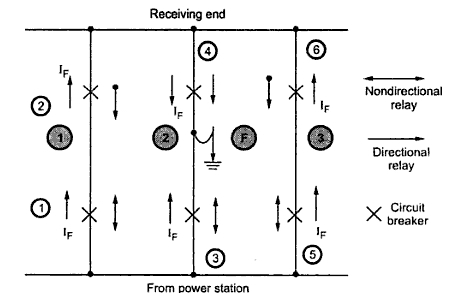 In this method also, the arrangement is such that the relay elements near the generating station are nondirectional while those near the receiving ends are directional. The directional relays are set for the lower time setting as well as current setting than the directional relays. Thus the directional relays operate before the nondirectional. In ring main system, the various substations are interconnected by the alternate routes and hence the overall system from a closed path. This ensures the continuity of the supply to the healthy part if any section of the ring is damaged and separated for the repairs. The Fig. 3 shows the method of protection used for the ring systems using nondirectional as well as directional relays. The relays near generating station must be nondirectional while the other relays are directional. The current and time settings of directional relays are lower than the nondirectional relays. The outgoing directional relays are set with the decreasing time limits. If the fault develops in a particular section say CD, then it will be fed from the source through path 'p' and path 'q' as shown in the Fig. 3. In such case, the settings are such that the relays at and only will trip the disconnect the faulty section. The remaining relays are inoperative. When an interconnector is used in such system, the relays used on it must be of nondirectional type.